Last year the IEA focused on shale oil in the USA as their main story and the news spread around the world that the USA would overtake Saudi Arabia as the world’s leading oil producer. The news generated many new declarations in the world’s press of “Don’t worry, be happy”. Every year the IEA also focuses on one particular nation or phenomenon that is presented as a large source of oil in future so that we do not need to worry about Peak Oil. Last year it was Iraq that would help to solve all our problems and this year it is Brazil. With this as a background, it is time to look a little more closely at the presentation of the newly released WEO-2013 report. “For billions more, any true sense of energy security is undermined by high energy prices. It is now more than five years after the onset of the global financial crisis, yet the recovery remains fragile; for many consumers and businesses, energy prices remain stubbornly high. Alarmingly, oil prices have averaged over $110/barrel since 2011. Such a sustained period of high oil prices is without parallel. ”Increasing vulnerability from resource scarcity and climate change, with the potential for major social and economic disruption”. We have never previously had global economic growth without increased use of energy. In reality, that means energy from fossil fuels for which oil is the leading component. Ten years ago the coupling between increased energy use and economic growth was what led the IEA to predict an energy demand of 121 Mb/d in 2030. Now they have reduced their expectations to around 100 Mb/d and the analyses we have made of the future show that this level of supply/demand cannot be realized. As IEA this year makes a detailed analysis of oil I have to come back and discuss this. The warning flag that the IEA has now raised should be taken with utmost seriousness. Dr Fatih Birol’s slides and oral presentation can be found at the IEA’s website (www.iea.org). Considering the limits he probably has on making statements on the future I would regard this year’s presentation as much more nuanced than last year’s. Last year I was actually present when he repeated his presentation in Stockholm. Below are some comments on his presentation. I share his view that high oil prices affect the economies of oil-importing nations. The fact that the USA has increased production of shale oil means that they do not have the same severity of economic problems with oil as the EU. To import oil at higher prices one must be able to pay for it with increased exports of goods and services. Sweden has succeeded quite with this well while other nations in the EU have not been as successful. The fact that the IEA now asserts that the high oil prices will persist means that it is time for oil importing nations to make fundamental changes in their energy policies. When the IEA studies which regions have a need to increase oil use it is mainly in the Middle East and India that this is seen. That the increase in use in China is slowing down is expected since they will become increasingly efficient with their energy use in future. The rate of increase of renewable energy use is not expected to grow more than for fossil fuels which means that the proportion that renewables make up of total energy use will continue to be the same as 20 years ago. This rate of increase of fossil fuels points to global warming of +3.6 °C. Regarding transport fuels the demand for diesel increases three times more than the demand for gasoline. This confirms what I wrote approximately 6 months ago. Another significant change is that the proportion of NGL, natural gas liquids, that is included in oil production statistics increases. In the USA, NGL has already replaced large volumes of oil feedstocks in the chemical industry and this will be an increasing trend. Then it was time to look at shale oil in the USA. Dr Birol asserted that there would be no second chapter of the shale oil success story that is now playing out in the USA. If one includes NGL then it may be that the USA becomes the world’s largest oil producer around 2020 but its production will then decline. Last year the IEA played down the future importance of the Middle East in oil production but this year they indicated that an increase in oil production from the Middle East is necessary. Those projects that are now seen ahead as necessary have long lead times and the investments must be made now. The increase in oil production that the IEA regarded as necessary from Middle Eastern sources was 6 Mb/d. Regarding production of conventional oil the IEA maintained its position that the decline in production from existing producing fields is 6% per year, i.e. that same decline rate that we published in 2009. The current rate of production of around 67 Mb/d will decline to 17 Mb/d by 2035 (i.e. in 22 years). Earlier, we don’t see that a realistic compensation for this decline in oil production could be envisaged. A later, more detailed study will show how things progressed this year. What the IEA currently presents as very important is Brazil. 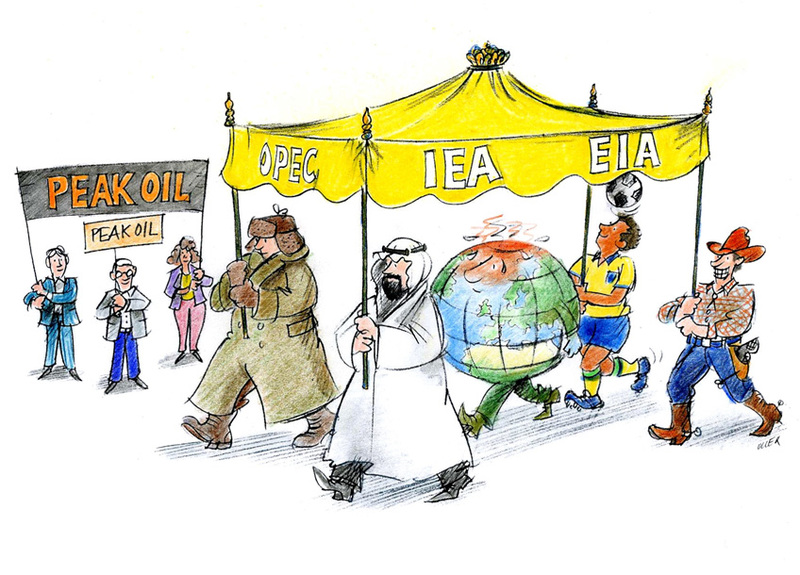 Thus, it is time to show again Olle Qvennerstedt’s illustration that describes the World Energy Outlook. IEA, EIA and OPEC say “Don’t worry be happy”. Brazil is the happy soccer player in the back corner. Regarding production of natural gas in the USA expectations are still quite high and my judgment is that these expectations are far too great. To make a better analysis I will need to read the complete WEO-2013 report and that will take some time. The conclusion that the IEA makes is that the price of natural gas in the USA will continue to be much lower than in other parts of the world and this will be significant for global industrial production. This must be interpreted as meaning that industrial production will increase in the USA. A detailed reading of WEO-2013 will probably give a more nuanced picture of the current and future situation than that I have gained from Dr Birol’s presentation in London. I see future developments of oil production to be weaker than expected and I can definitely say that the polished future predictions made by the IEA ten years ago are well and truly dead and buried. My 2004 analysis has proven justified. ← A Journey Through Eagle Ford, November 2013. Nice article, thanks. A few comments. What is also amazing is the growing discrepancy between the “summaries” and key messages taken out by the media, and some harsh realities still presented in the report. Add to that some other discrepancy between the report and “objective information”, and the picture is really bleak..